This is the second part in a series of three tutorials. 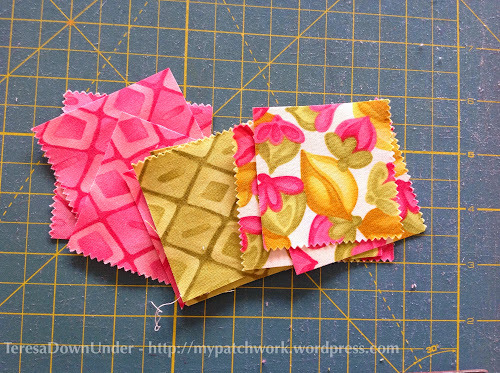 Part one shows you how to make a Christmas themed quilt top using charm squares. In this tutorial I will embroider a French Christmas children song on the quilt top and do some other embroidery on the white fabric as an extension to the fabric print. French Christmas song embroidery for tracing (pdf). WARNING: The song sentences do not fit the zig zag lines exactly. You will need to move the paper to make it fit better to the zig zag path. Print pattern and stick together. Placing the paper underneath the top, trace the song making sure the words follow the white fabric zig zag area. Using stranded cotton in matching colours embroider the song using stem stitch. The song has been embroidered. To complement the poem, I decided to extend the patterned fabric into the white areas so I selected some prints and drew the rest of the flowers or graphic elements using a water soluble marker. Just a few graphic elements here and there. Spread out throughout the whole quilt. And then I embroidered those. I like the look of the pattern overflowing the white areas. The top is ready for the backing and quilting. This is the first tutorial in a series of three that makes a Christmas themed lap quilt. 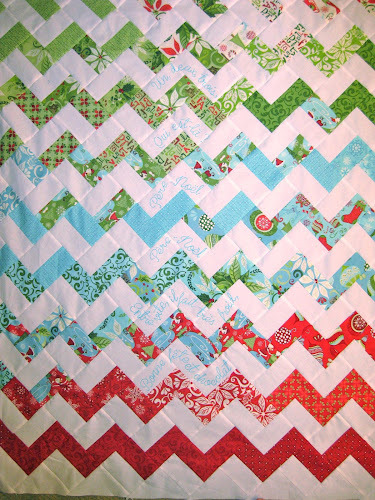 The quilt top has a zig zag or chevron pattern with a Christmas theme. Important: do not throw away any of the charm squares trimmings. They will be used in the backing of the quilt. 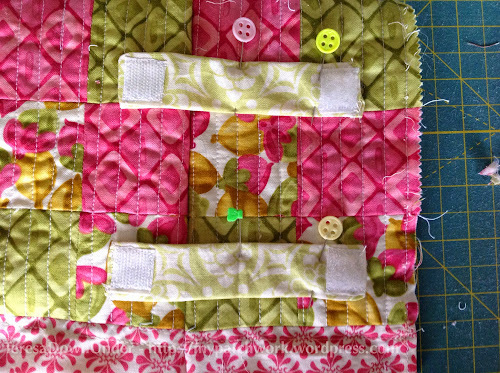 The layout is very basic and is made of 2 rectangles of contrasting fabric stitched together. 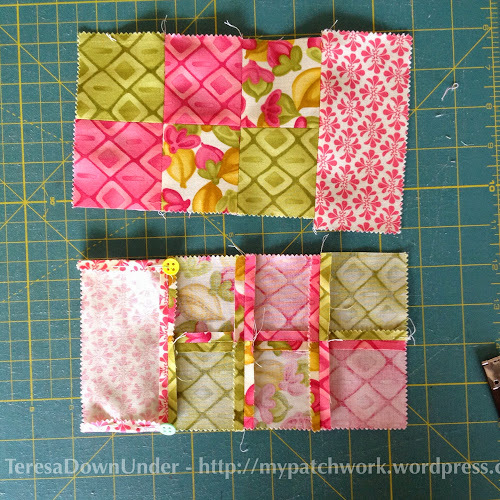 For each block, trim 1/2 inch off one side of the 5in charm square. You will obtain a 5in x 4.5in rectangle. 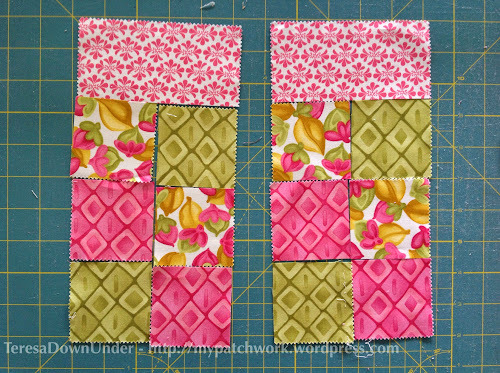 Then cut the resulting rectangle in two again so that you have 2 rectangles measuring 2.5 in x 4.5in each. For each rectangle cut an equal rectangle 2.5in x 4.5in in white. 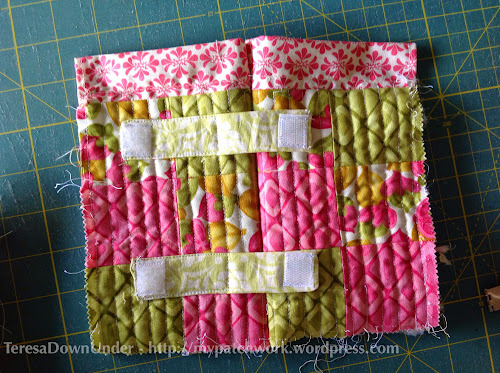 Stitch both rectangles together. You have one block. Place the blocks in a zig zag way as per diagram below. The quilt is set on point. This tutorial illustrates what set on point is. 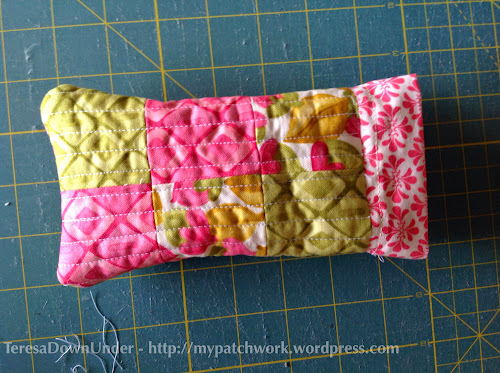 Basically you sew the quilt in rows in the diagonal with each row starting with a triangle. 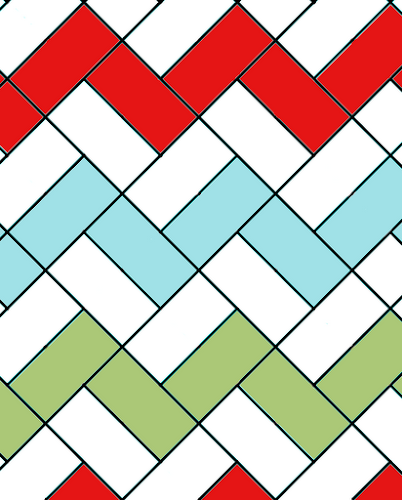 In this quilt, after you place all blocks as per diagram above you will end up with 2 corners where you will place 2 large triangles together to make a larger triangle (see first photo – the top corners in the photo are made of 2 large triangles). And you will have two more corners with just one small triangles ( and the bottom corners use the 2 small triangles). The top is now completed. In part two we will embellish the top. The bag is 14 1/2 inches high and 15 inches wide. 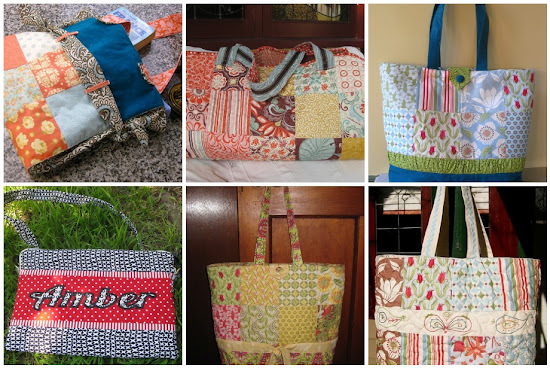 This patchwork tote bag has a set of pockets and key holder sewn into the lining. 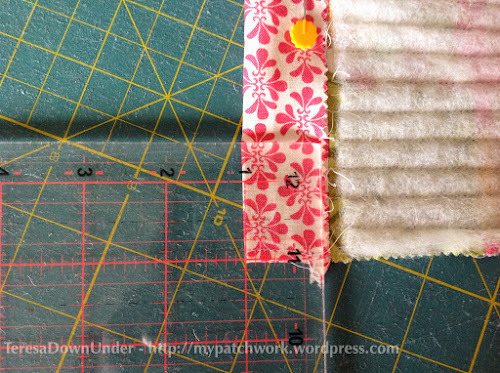 Cut 2 strips of fabric measuring 2.5 in x 36 inches. 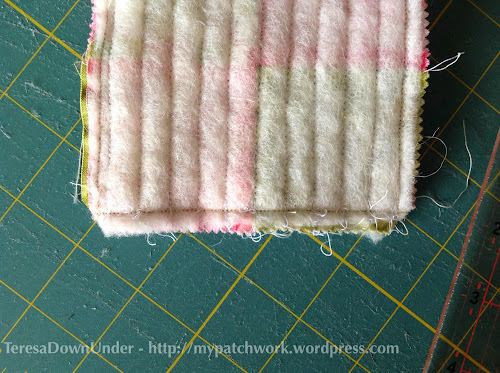 Using a basting stitch, sew along both sides of each strip. 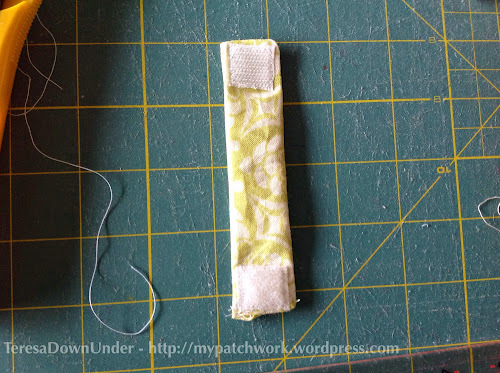 Pull from the bottom thread while you hold the strip of fabric. 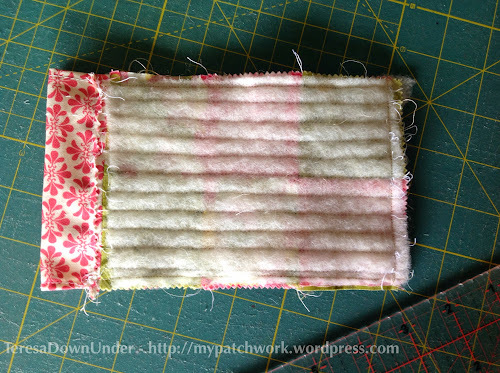 Pull from both sides and distribute the folds equally along the whole strip. Try to align the folds vertically. When the folds have been evenly distributed, place the gathered strip on an ironing board and stretch it pinning both ends of the strip to the board. Placing both panels of the bag on the ironing board while you’re gathering the strip helps deciding when the strip has reached the right width. Iron the folds lightly as if you were combing them. Don’t press hard. 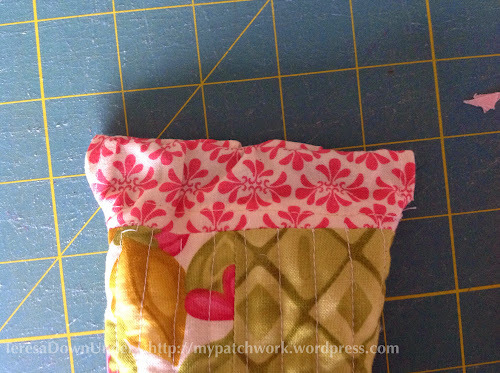 Press the seam allowance so that it is easier to stitch to the bag. Cut 2 pieces of 24 in x 4 in for the handles. 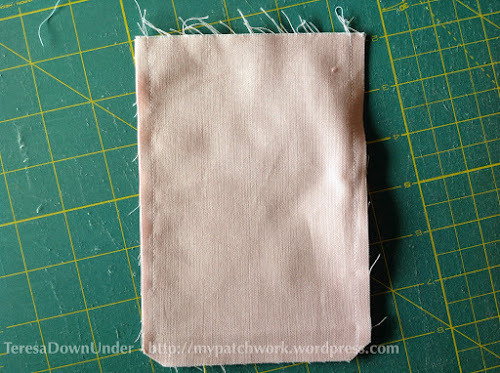 If you want stronger handles, use fusible interfacing. I used medium weight. Anything heavier will make it very hard to turn handles inside out. Cut 2 pieces of fusible interfacing slightly smaller than the handles and iron to each piece of fabric as per manufacturer’s instructions. 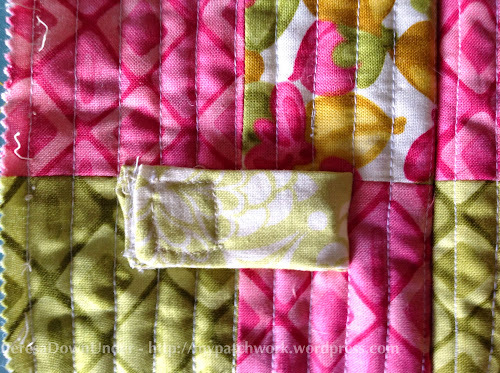 Fold the rectangle along the long side with the right sides of the fabric together making a tube and pin along the seam. Stitch along the long side. 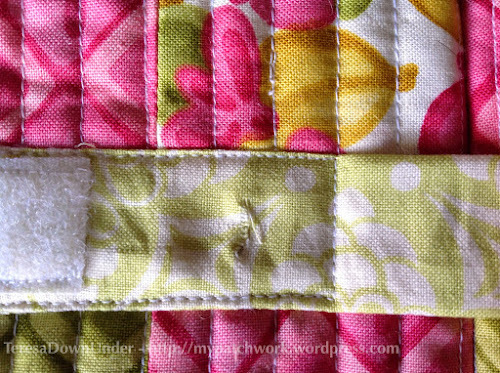 Press flat and top stitch along each side with a 1/4 seam allowance. 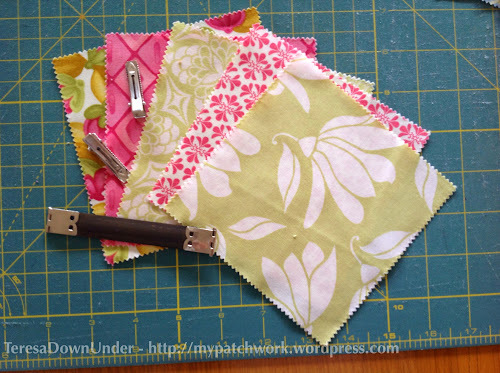 Cut four 5 inch squares from the handles fabric. 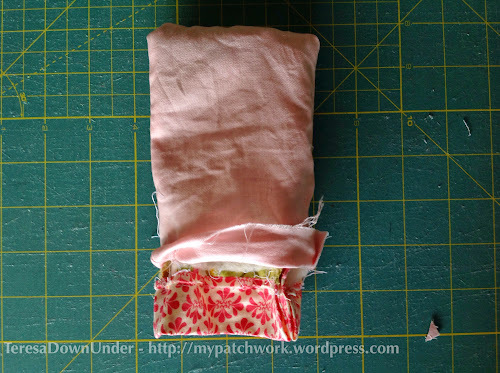 Fold in half wrong side of the fabric together. Stitch around the 2 raw edges. On the long side of the triangle make a cut as close to the edge as you can. Turn inside out and press well. Pull so that the two edges of the triangle will join in the center. Tie a knot to keep edges together. Fold end of handle in and press. Then make a triangle as per picture and press. Place handle over ears and pin. Sew in an arrow shape. This is the finished handle. Cut a rectangle measuring 6.5in x 4in for the loop closure. Fold one side to the middle point. Fold the other side in the same way. Fold and stitch as per picture and stitch on the side. Then fold as per pictures. Stitch close to the edge as per picture below. 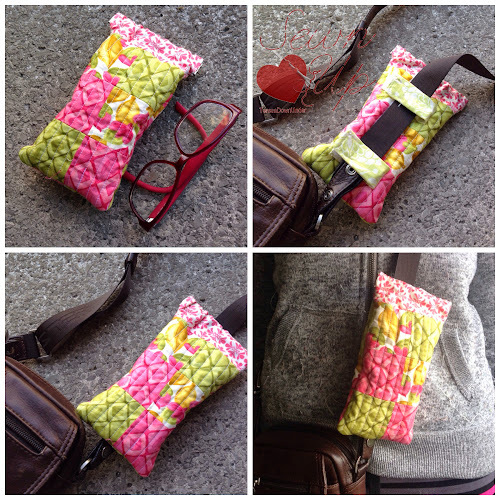 For each side of the bag, stitch 2 rows of 4 charm squares each and then stitch both rows together. Iron with seams open to get a flatter look. You will end up with 2 rectangles measuring measuring 18.5in x 9.5in. 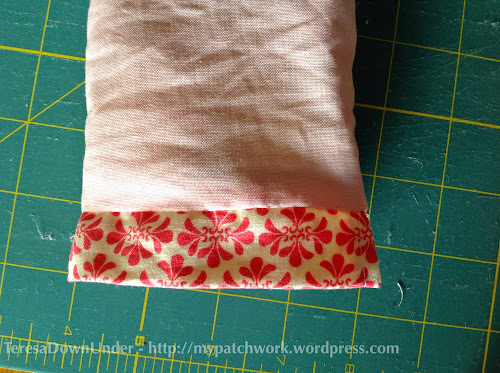 WARNING: Measure the width of your final rectangles well after sewing and before you cut the rectangles that make the top of the bag so that the width is the same. From the matching fabric cut two 8in x 18.5in rectangles, or the width of the stitched charm squares. 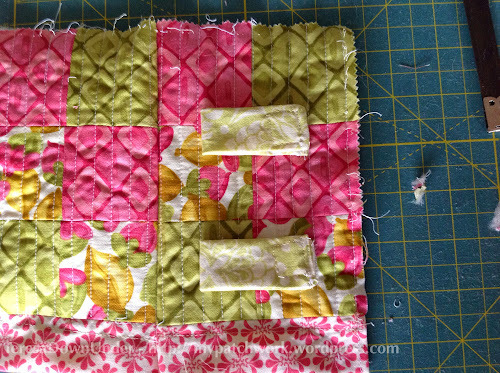 Place the pieced rectangles on top of the matching fabric to make sure the width is the same (see picture). Time to stitch the gathered strip you made earlier. 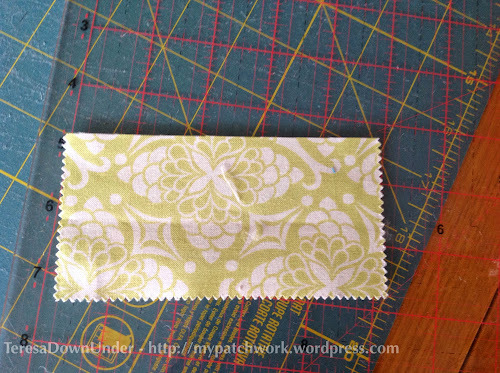 Pin the gathered strip of fabric to the top piece (see picture below). Make sure the ruffled seam allowance is flat. Pay special attention when sewing in order to avoid the ruffles raw edge showing on the right side of the bag. 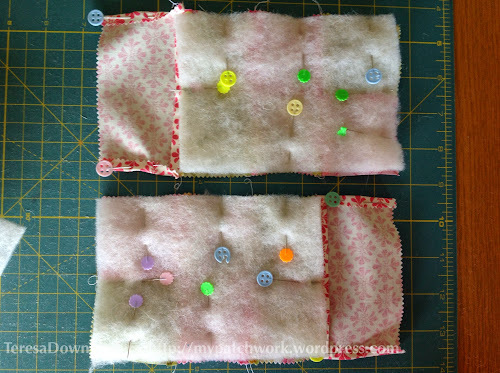 Pin the other side of the gathered fabric to the bottom panel and stitch in the same way. Adding interfacing is optional. I have made other bags without using interfacing but the end result is a bit soft. I like my bags to stand up when I put them on the floor. 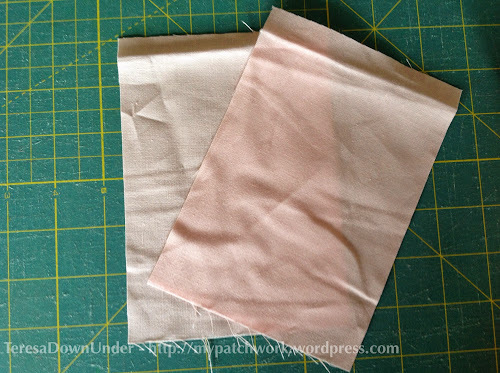 Cut a piece of fusible interfacing (medium to heavy) 1/2 inch smaller than the sides of the bag. Iron to the back of each side of the bag as per manufacturer’s instructions. 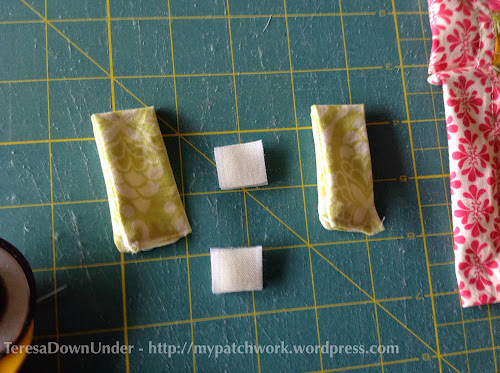 Cut a piece of batting slightly larger than the sides of the bag and pin. 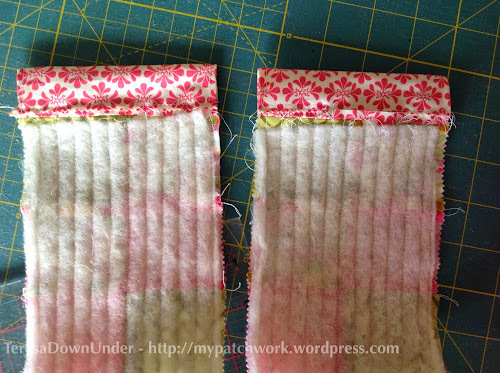 To attach the batting to the bag, stitch across the sewing lines on each side of the gathered strip. 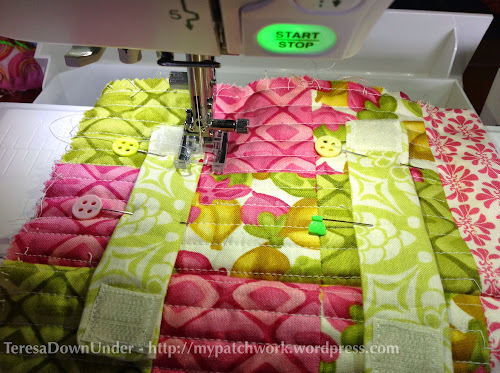 Then stitch along the pieced lines on the bottom of the bag. Put both sides together with right sides facing together and stitch around 3 sides leaving the brown side up open. Fold the bag as per picture below. Trace a line at 2.5 inches from the corner. The bag has now got a bottom. Place the handles 4 1/2 inches from the side. And 2 inches from the triangle corner up to the edge of the bag. 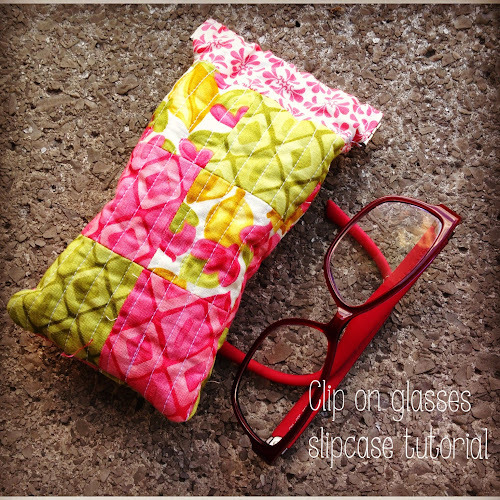 Stitch in a triangular shape twice around the bottom of the handle. Place loop between handles as per picture. We’ll stitch it when we attach the lining. The bag has a set of pockets and a key holder. Cut two strips 2.5 x 18 inches for the top of the lining. Cut two 16.5 x 18 inches for the bottom of the lining. Pin strip and rectangle together (see picture below). Cut a rectangle 18 x 10.5 inches. 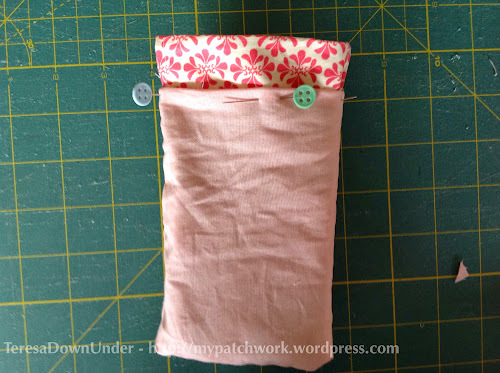 Fold in half right sides of the fabric together to make a tube. Top stitch very close to the edge and then again 1/4 from the edge on the top of the pocket. 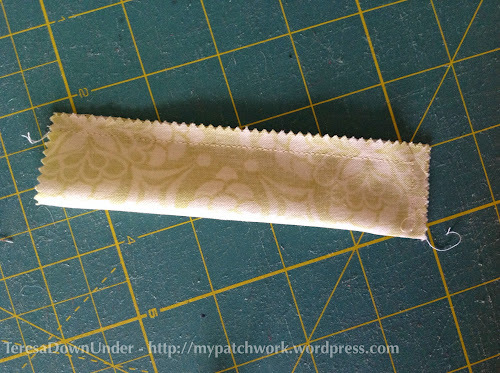 Cut a piece of ribbon around 10 inches long and stitch to a key holder. 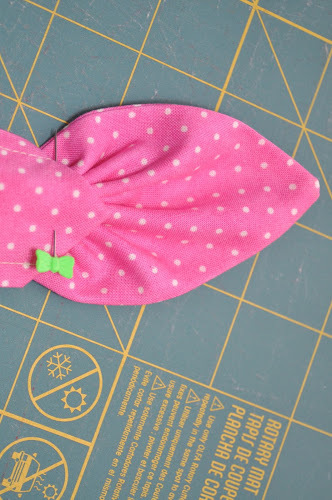 Place the ribbon edge at around 5.5 inches from the top of the bag on the side and pin. 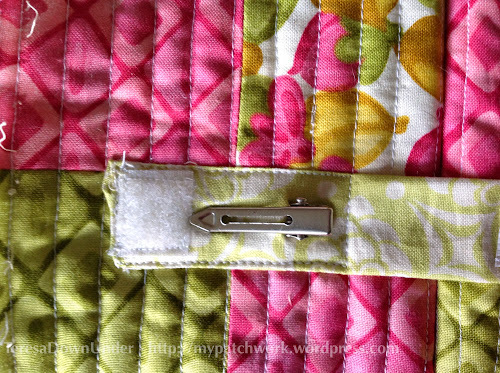 Place the rectangle for the pockets over one panel of the lining with the top of the rectangle at around 5 1/4 inches from the top and pin. Stitch along the sides and bottom of the pocket. 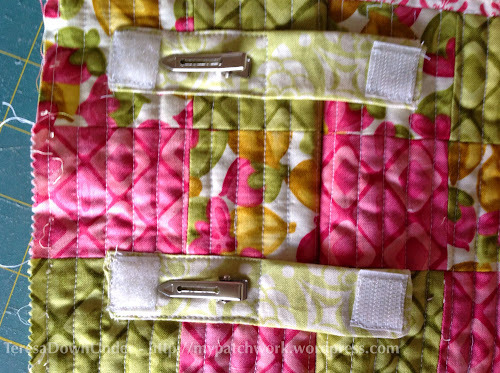 Hide the key holder in one of the pockets to avoid stitching other than the edge of the ribbon accidentally. 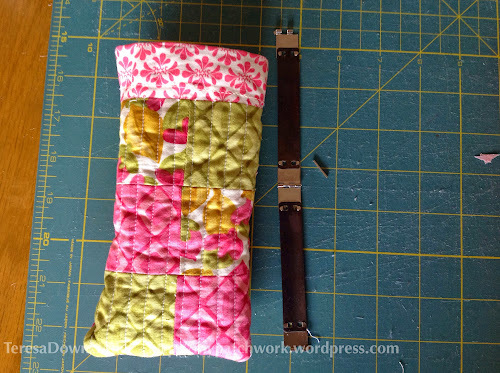 Then make several pockets by stitching vertically several times. 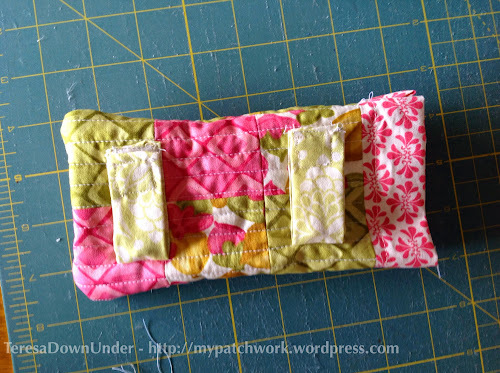 The first pocket will hold the key so you can make it 2.5 inches wide. You can adapt the width of the pockets to suit your needs. 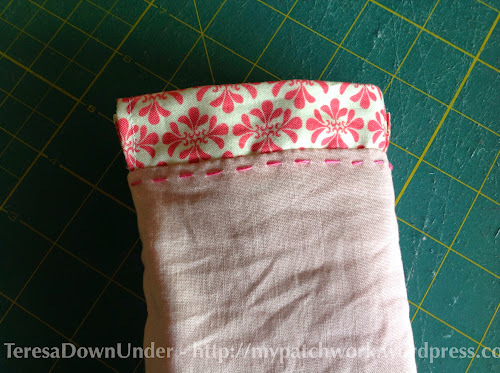 Place both pieces of lining right side together and sew around the sides and bottom. Leave a 4 inch opening on one of the sides to turn bag inside out one we stitch the lining to it. 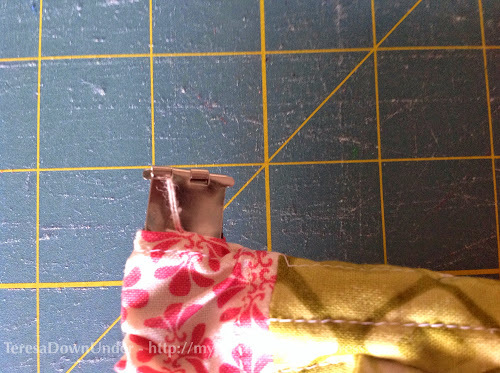 Then do as for the outside bag: cut across the corner 2.5 inches as per picture and stitch again. 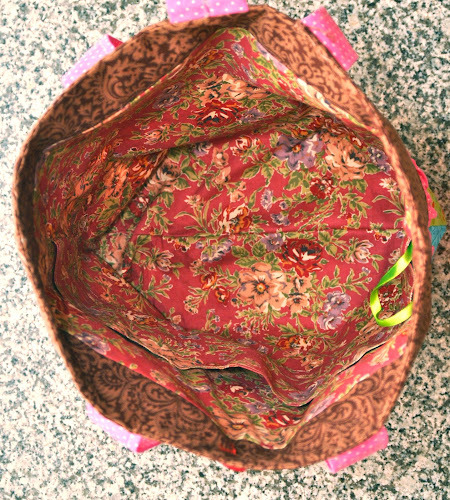 Place the lining, inside out, over the outside bag as in the photo and pin along the top edge well. Just in case it is not clear in the photo, the right side of the fabric for bag and lining should be facing together. 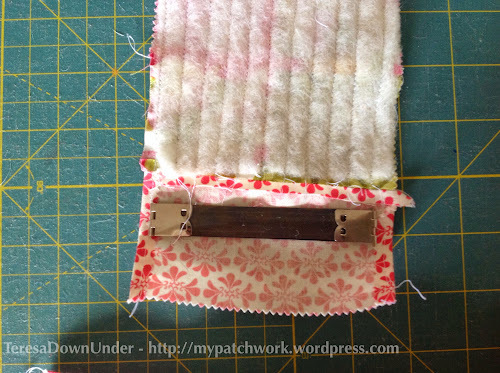 The opening showing is the photo is about 4inches wide and will be used to turn the bag inside out once the lining and the outside a sewn together. Stitch lining and bag together along the top edge. 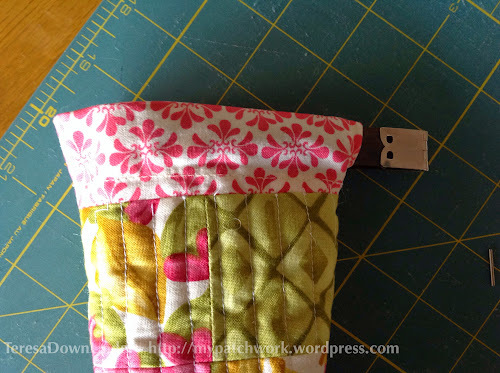 Stitch a button in between handles. I tend to make things for friends rather than buying gifts. I made this bag for my friend. 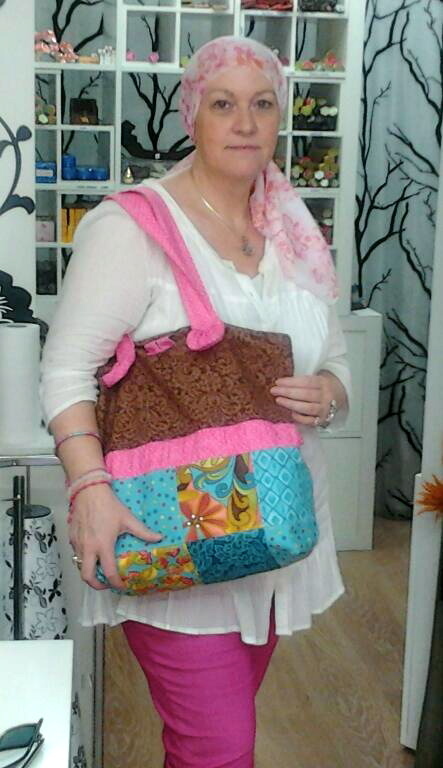 And here she is below wearing the tote bag.